A couple of years ago, Jaime and I went to Puerto Vallarta to visit his high school friend Naomi and her two incredibly cute and precocious little boys and to bask in the sun and eat delicious food. Rather than stay in town, on Naomi's recommendation, we headed off by boat to a tiny little cove in a town called Yelapa. For three endless days, we stayed in a casita at the beautiful Hotel Lagunita and spent our afternoons lazing under the pelapas on the beach, reading beach fiction, and practicing our broken Spanish with the overly aggresive local parrot. One evening, we headed up the hill behind the beach to explore the windy, narrow streets of the town, peering into backyards filled with banana trees and chickens, greeting old friends of Naomi's, and ending up at dinner at the amazing Pollo Bollo. There we closed the night nursing warming bottles of beer and licking our fingers clean of the tangy sweet sauce that accompanied the succulent tender to the bone BBQ chicken that is their specialty. Another night, we wandered into the Yelapa Yacht Club, where the hopping local expat community jammed the night away to a mix of Tom Petty and world beats. But some of my favorite memories of Yelapa were the mornings. The casitas at the hotel were open to the air and we woke up to the sound of the surf and the smell of the exposed wooden beams and salty air. We walked out the door down the flower-lined gravel paths out to the beach. Jaime and I were the only guests, and they had set up a lone table under a pelapa where we sat and ordered our breakfast. Strong Mexican coffee, juice, and delicious delicious food. That was the first time I ever had chilaquiles -- Jaime and I hadn't ever heard of them before, and he ordered them as an experiment. They were served hot, with scrambled eggs and beans with a side of salsa, maybe some avocado, but definitely a stack of warm, fresh corn tortillas. They were so delcious that it didn't seem at all weird to be putting cooked corn tortillas inside of more corn tortillas. So when I looked in a corner of my kitchen the other day and saw a bag of stale tortilla chips, it got me thinking of that happy memory and the delicious mornings and how much I'm missing Jaime these days, and I had to try to recreate the moment. I'm the first to admit that food can be oh-so-comforting when you need something to cheer you up. I'm quite sure they made their chilaquiles in Yelapa with stale tortillas, as is traditional, but this technique seemed to work just as well, and it probably takes even less time since you don't need to fry the tortillas in oil before starting. Heat a dry cast iron skillet until hot but not smoking and toast jalapeno and dried chiles until lightly browned on all sides (3-5 min). In a small pot, bring 1.5 cups of water to boiling. 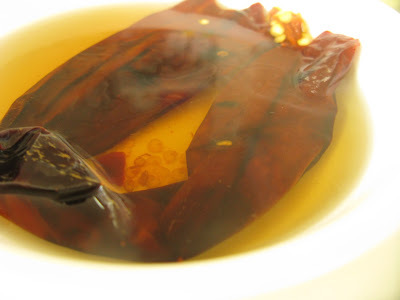 Place dried chiles in boiling water and remove from heat. Allow chiles to sit for 10 minutes to reconstitute. 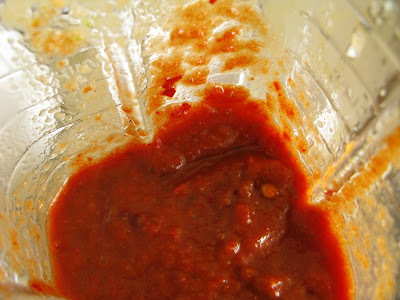 Water should turn reddish-brown and chiles should become pliable. Meanwhile, coarsely chop tomatoes, garlic, onion, and toasted jalapeno. When chiles are done soaking, add chiles, 1/4 cup of the soaking water, chopped vegetables, and chicken broth to blender. The chicken broth gives the dish an especially full flavor, but you can also substitute 1/4 cup extra chile water to make the recipe vegetarian. 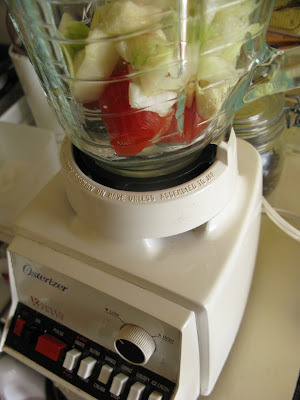 Blend ingredients until completely smooth. Heat 1 tbsp olive oil in a cast iron skillet. 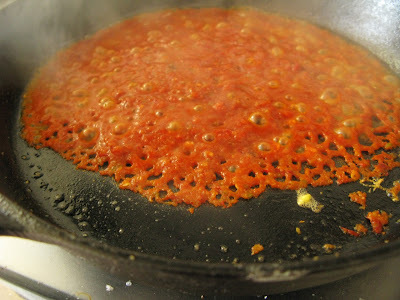 When hot (you can test to see if it's ready by throwing on a drop of the salsa and seeing if it sizzles) add in salsa and fry for about 5 minutes, until the color deepens slightly and the consistency turns a little thicker. Turn down the heat to medium and season sauce with salt. Add in stale tortilla chips and stir well to coat. 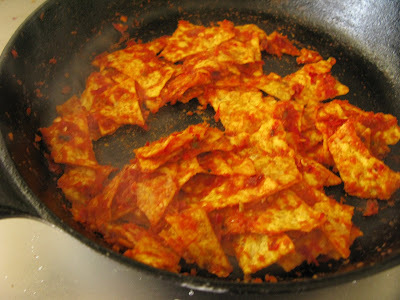 Cook for at least 5 minutes -- the sauce should soak completely through the tortilla chips. They should lose their toughness and turn moist, but not mushy. 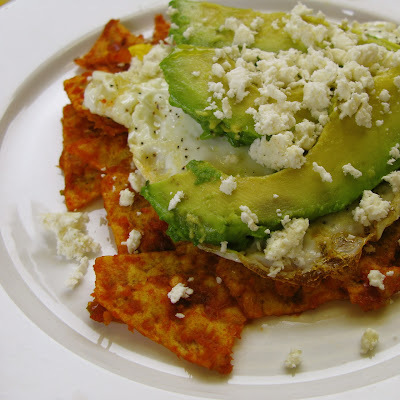 Top chilaquiles with your choice of garnishes and serve with warm beans. Hooray! So glad it came out good. I love love to eat them topped with fried eggs with slightly runny yolks. Mmmmmmm.